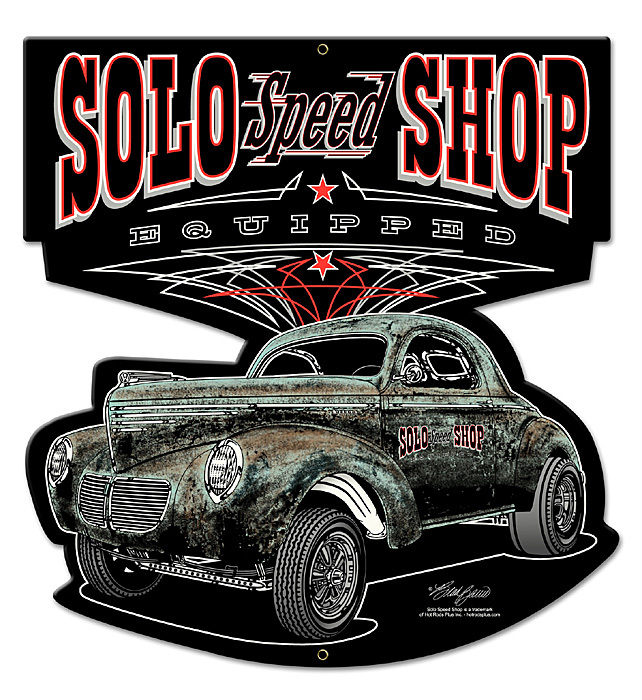 SOLO Speed Shop Willys Die Cut Sign - 24" x 19".. The quality is outstanding, using heavy gauge metal, rounded corners, and reinforced rivet holes for hanging. These are NOT flimsy, overseas made, cheap signs, but made right here in the USA by our exclusive supplier. These come shrink wrapped for protection and boxed carefully. This exclusive die cut sign features the SOLO Speed Shop Equipped ‘40 Willys gasser coupe in it's true original patina version in large 24"x19"! A true testament to Old School at its best, this ‘40 Deluxe is decked out with all the period correct equipment, with a stance that defines the “gasser” era.